There are many denture wearers that have spent months or years dealing with loose and "floating" lower dentures. The problem is widespread and even in cases of well fitting dentures the problem persisits. Traditional dental implants have helped many solve this problem. An alternative to traditional dental implants is the "mini" dental implant system. "Mini" implants require less invasive surgery, are immediately able to accept loading by the denture and are generally much less expensive. 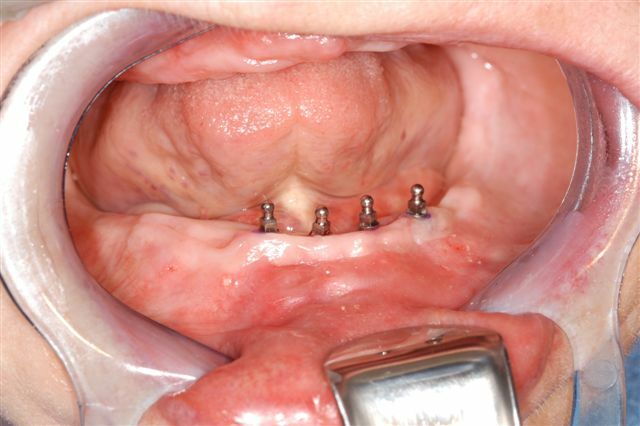 In one visit a lower denture can be stablized to perform almost like natural teeth.